Smooth PVC vertical blinds from Blinds Chalet are an excellent choice for home, apartments or office locations. Looking for a simple and attractive way to cover your windows and sliding glass doors our verticals are the answer. 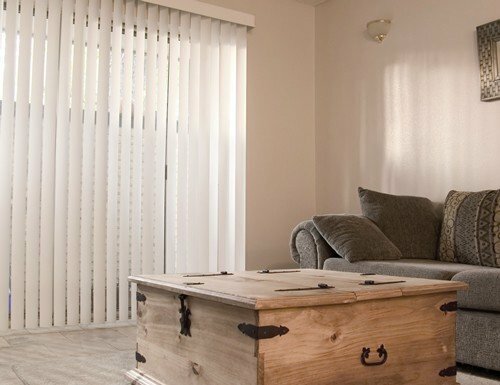 These Inexpensive vertical blinds are cost efficient and easy to use. Our verticals allow for total privacy or complete openness for a full view from your windows. Order your PVC Blinds Online from Blinds Chalet! Can I just purchase replacement vanes? I am just wanting to change out the color of my vertical blinds. Yes, we are able to do that for you. What size and what color would you like. Can I pick them up instead of delivery? Shipping is free on our blinds an it is hard to use will call as we have manufacturers all over the country. This particular product is made in Southern California. what manufacture? describe the controls. what is your location? Each of our vertical blinds are private labeled for Blinds Chalet. The standard controls come with a cord to draw the blinds and another to twist the vanes. We are located in Mesa, AZ. Good quality product that’s relatively easy to install. Good quality product that’s relatively easy to install. Cord & chain controls are short (for safety reasons I presume). The size of blinds were cut to perfect dimensions. Very pleased with these blinds! The blinds are exactly what I thought they would be. The blinds are exactly what I thought they would be. They are perfect. I bought blinds from you many times, also under my wife's name. I bought blinds from you many times, also under my wife's name. I always thought that the products are excellent for the price, the 2 in Faux Wood looks super high quality, verticals are wonderful and the installation is easy. ordered and assembly instructions were easy to follow. Very satisfied with product and service. Would highly recommend Blinds Chalet. Thank you.